The museum welcomes all little and big gourmets for the discovery of the Secrets of Chocolate. We also offer animations specially made for them. At the end of the visit you can enjoy the animations for the Little Gourmets ! 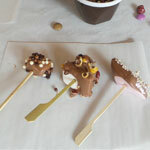 Decorate a chocolate bar, make your own lollipop... and take your "gourmet creation" back home. How much ? free : included in the price of the children's ticket. Is the mother of an Easter egg a chicken made of chocolate?